You could probably send matter down that line 🙂 Impressive. Updating the firmware was problematic in Ubuntu, but a breeze in windows 7. On Windows, get the MFT from the Mellanox website. Binaries are installed by default in c:Program FilesMellanoxWinMFT. Open a command prompt as administrator (Browse to c:windowssystem32, right click on cmd.exe and open as administrator). Cd to the WinMFT dir, and then follow the instructions from the Mellanox website on how to find the adapter information, which firmware to download, and how to burn it to the adapter. Oh, and I had to use the -skip_is parameter with flint to get the firmware to go on, and it worked fine. I did both adapters this way. But i’m still wondering about something : according to your tests, 10GB bandwidth is available per port… So, how to optimally use the two ports : aggregate them (20GbE) (how ? ), daisy-chain, etc… ? I forgot to suggest : 2 computers linked @10GbE each one to a “central” computer while using on this the 2 ports ? XZed, I havent experimented with port bonding yet, mainly because the disk subsystem in my raid box is nowhere near maxing out one port, never mind two. I’ve seen howto’s on linux, but windows may be a bit more difficult. Epic. I followed the same path and came to the same conclusion a while back, but didn’t have a proper server at the time. I just upgraded to a box with a PCIe slot, quickly dismissed 802.3ad for bandwidth increase, determined that Infiniband was still affordable, then decided to Google “Infiniband at home” just for fun. Thanks for confirming what I thought was correct! Thank you very much daveh for your answer :). And i’m glad to see that we are a few ones landing to this post after such researches :). Maybe You can help me: I am just starting with Infiniband. I want to send messages like “Hello World” between 2 PCs. I don’t want to use MPI, because I need to make a relatively low-level program to control the Infiniband port. I need to programme a simple C program, to connect both PCs. Why I need to do this? Because later I will connect one of the PCs to a particular device which has an Infiniband port. At this moment I don’t know which kind of protocol uses that device. The only thing I know, is that this device can send and receive bytes. So, the first step I want to accomplish in order to do that, is connect 2 PCs with a simple C program, with a device level code. I’m trying to use a File Descriptor, using open(), read() and write(). But my problem is I don’t know which Device File must I use (I am trying with different files that I can see in /dev/Infiniband/ – I am using Centos 5.5). But I couldn’t reach any positive result with this. David great article ! I just ordered the same Mellanox cards fom ebay. Btw as these cards are dual port could i have my server connected to 2 client PC’s at the same time ? Lance, Yes, just assign IP addresses on different subnets to each port (ibo and ib1), and two client PCs is possible. @Gustavo, You need to know what protocol you’re going to use, otherwise the possibilities are endless. UDP, TCP, port numbers, etc. Strongly encouraged by your article, i finally got the same package that you adviced. Obviously, i’m conscious about “being bottlenecked to 10Gbs” due tu the MHEA28-XTC. But i don’t care, my main goal was to, at least, achieve the same performance you encountered. Between 2 windows 7 boxes, i reach and average 3Gbs :/ … Obviously, i made tests similars to yours (indepently from physical storage : card to card). As i knew not being bottlenecked by physical storage (due to being RAID storages), i even made real transfer tests : the previous value was reported (~ 3Gbs). Meanwhile, I read a alot about RDMA, SDP, WSD, SRP, iSER, etc… Indeed, RDMA seems the only way to achieve such speeds (In my case, i could reach 8Gbs w/ RDMA transfer tests). I quite thought having found the solution : set up SRP/iSER in order to transfer files and optimize bw using iSCSI over RDMA. But, it seems impossible to setup a simple iSCSI target/client scheme between 2 Windows computers (to be accurate, iSCSI target doesn’t exist for Windows (only initiator) : only for Linux w/ SCST program)). But, whatever, i couldn’t how you reached such bandwidth on IPoIB ! I wanted to ask you about real tests, but you can’t really prove IB bw as your RAID storage “only” reaches 2Gbs. Since it, i don’t know if you enhanced your storage. By the way, could you post your forum sources in order i read their setup ? I have not done much since my initial testing on this, exept today I placed an order for 5 Seagate Barracuda 7200.12 drives at £35.99 each from Scan.co.uk. Next step is to set them up as a raid 0 array (later I’ll change to raid 5) adn test the drive throughput, then test across infiniband IPoIB. The initial 7gbps speed was using netperf, and I have not been able to replicate that since, as I’m now using the drivers with the stock Ubuntu distribution. Still, Ramdisk to Ramdisk is giving me about 3gbps. nfs with rdma may not be possible, as windows home premium does not have nfs client capability, and even if it did, I’m not sure if it supports nfs over rdma. Still, I might look into iSER, etc. Well, i just hope you’ll share your results as soon as you’ve set it up :). I set up iSCSI this evening. Amazingly, the iScsi initiator software is in Windows 7 Home Premium, and not kept for Pro or Ultimate, like other useful software like software raid or NFS client. Anyway, using the above tutorials, it was a breeze to set up iSCSI across the infiniband fabric. And, a file copy that previously used 75% CPU now uses only 25% CPU. Next is to wait for the 5 new drives to arrive so I can build a decent raid array and give this a good testing. But, you seem enthousiast about “just” iSCSI over IPoIB (i suppose you used IP). Thanks for the links, very useful. I’ll try that. I am using the target provided for by the “iscsitarget” package (which I now realise is the wrong one for RDMA). I do indeed want to use RDMA, so the second link you provided has very inportant information about removing the iscsitarget package before installing iscsi-scst. Very good to know. The windows OFED distro does mention SRP, but I don’t think I have that option currently installed, and my windows machine gives errors when I try to install/change/remove anything to do with OFED. I might have to re-install altogether to get the SRP functionality loaded onto my windows box. Glad to have given you such a good link :). Indeed, i also had such effect (errors while trying to modify any previous OFED install) and resolved it by uninstalling/reinstalling the whole thing. OK, with the hard drive controllers I have in the linux machine, the fastest I can get the drives going is 350MB/sec. I’ve now got iSCSI targets configured in both normal iSCSI and RDMA protocola. However, the brick wall I’ve just hit is that the iSCSI initiator configuration on windows does not see the SRP targets, only the regular iSCSI targets. Seemingly the iSER initiator software is only available on linux. I’ll just have to live with regular iSCSI. Mellanox WinOF VPI for Windows version 2.1.3 was released in Feb 2011. 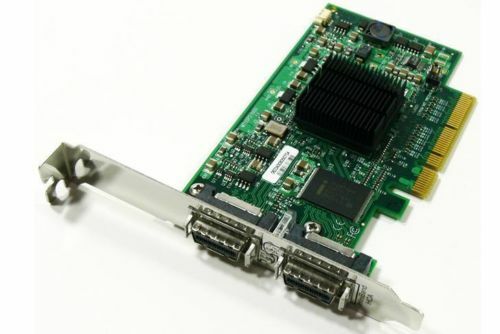 This contains drivers for ConnectX based adapter cards and has Windows 7 support. Also has Beta support for Winsock Direct, Sockets Direct Protocol (SDP) and SCSI RDMA Protocol (SRP). So, to get SRP on windows I’d need to update my HCA. Your throughput problems are most likely due to CIFS/Samba, which is horribly latency sensitive, and Windows has a high latency turnaround. You’d need to run SMB2 from a Vista client to Samba (assuming it supports SMB2 these days) . Or, alternatively, use an NFS stack on Windows. Great article, very nice read. Only a 25% CPU load sounds very good. But I will wait a bit before jumping on the beyond 1GB bandwagon. Wait until we see a bit more about Intel’s new Thunderbolt. This should be a bit more future proof, and cheaper, compared to infiniband, hopefully. I did a lot of testing with Infiniband in a commercial setting and found your comments about it as a useful starting point to understand infiniband in general. Initially for testing we started using DDR hardware and that works really well. I was able to get good speed from it. However, when we finally got the FDR hardware we were initially disappointed as it wasn’t much quicker than DDR and for small packets it was slower for us (using our own custom RDMA protocols). What I found was that memory speed starts coming into play and many other factors that actually require a faster PC (rather than a cheap home one). And also, as you found out, software design makes a huge difference. So if you do start experimenting with Infiniband at home, DDR works well but as you start getting quicker, the PC’s at each end need to be quicker. Particularly the memory. Thanks for posting your research,im wondering did you fiddle with the buffer sizes in samba/nfs?it supposedly can make a difference….